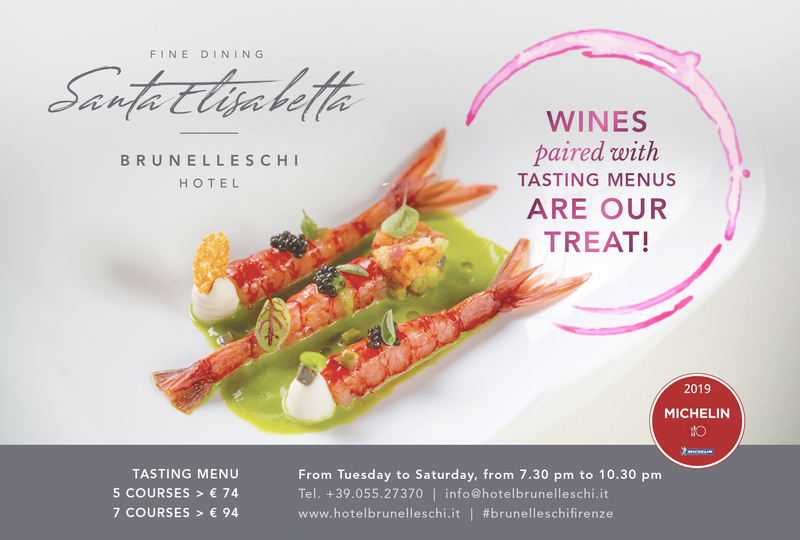 Presenting the Santa Elisabetta, our luxury restaurant on the first floor of the 4-star Hotel Brunelleschi in Florence. The Tuscan capital features a host of exclusive settings, but only here can you find the celebrated harmony and culinary art, which skilfully combine tradition and innovation, showcasing a true luxury restaurant. You will enjoy a view over a fascinating corner of the city from the Byzantine Pagliazza Tower. The first-class décor and sober elegance make the perfect backdrop for the most memorable, emotion-packed moments of your life. Choose this luxury restaurant in Florence for your wedding reception or a romantic dinner. Chef Rocco de Santis will indulge the senses of all his guests, with vegetarian, vegan and gluten-free dishes as well. Days and opening times: from Tuesday to Saturday from 7.30 pm to 10.30 pm. Closed from 30 July to 29 August 2019. Upon request, special menus for vegetarian, babies and persons with coelic disorder can be prepared. The restaurant, which is mentioned in the 2019 Michelin Guide, has been awarded “due forks” with a score of 80/100 in the 2019 Italian Restaurant Guide compiled by Gambero Rosso and “a chef’s hat” in the 2018 Gourmet Guide by L’Espresso. It is a Maison Recommandée Perrier-Jouët and thus, just one of a handful of recommended restaurants in which you can enjoy a glass of Perrier-Jouët champagne, savouring an atmosphere enhanced by a customised décor reminiscent of the nineteenth century. Our wine cellar has 250 Italian wines curated by our sommelier, Alessandro Fe.